After seeing Crazy Heart with Jason this afternoon I headed down Lincoln Blvd to Lincoln Fabrics, which is a wonderful slightly grungy warehouse filled with some gorgeous fabrics. There are cute cotton prints, jerseys in many different weights and colors, some fabulous vinyls, and so much more. I haven’t yet devised a project to use some of their awesome woven elastics, but Crazy Heart has given me an idea about how to use this beautiful ribbon. It will be a fun and challenging project that I’ll get a lot of use from. 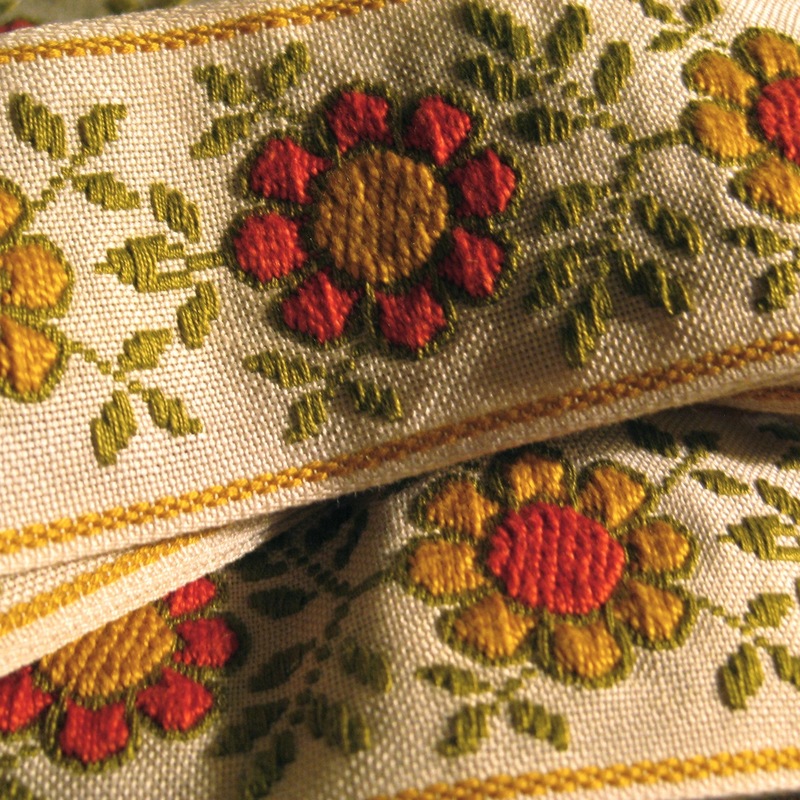 When I was in Innsbruck I went to a folk art museum and saw some ribbon on a mini loom, and since then I’ve been eager to learn how to weave. No progress on that front yet, but this ribbon reminds me of that goal. Plus the colors and style will go perfectly with some vintage fabric I got a few months ago at the new Goodwill on Jefferson Davis in NOLA. I’ve been working on lots of little projects since I’ve been in LA. I’ve got some bigger ones to post soon, but before I spend a few more hours on the interweb I’ve got to cross some things off my to-do list. Tonight’s main goal is to sew additional buttonholes and buttons onto a vintage men’s shirt that I tailored to my ladiness a couple years ago. But just to show that I keep busy, here’s something I did the other night. 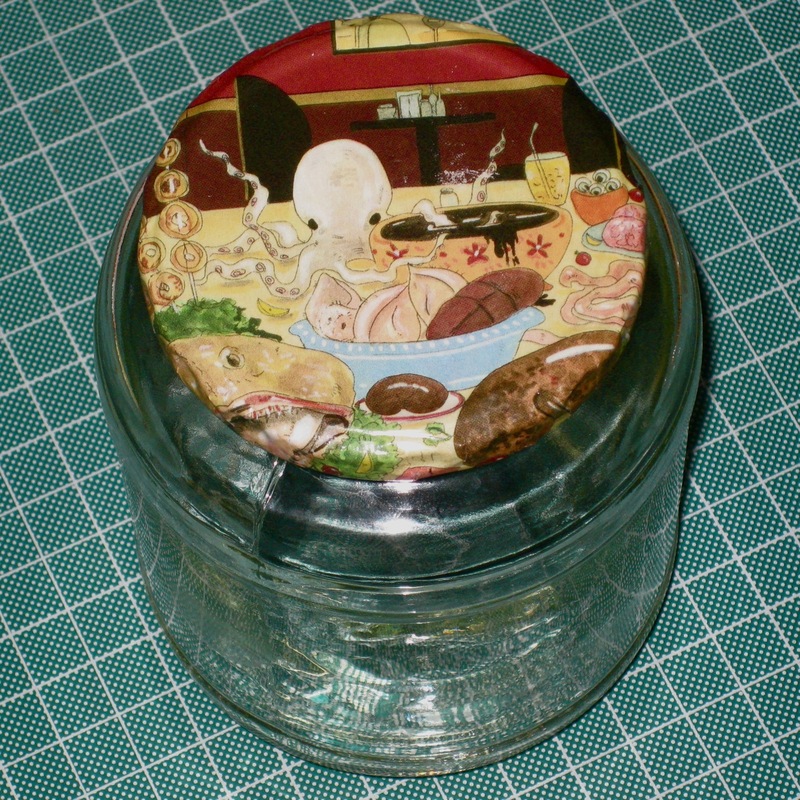 I found a funny illustration of an octopus in the New Yorker and decided to put it on the lid of an empty pickle jar. I glued it on, slit the sides for a smooth fit, and coated the whole thing in tacky glue. I’m not sure what I’m going to put in the jar yet, but I’m sure it will be just the right thing. Today, I am finishing up the tunic I am making from the blue silk pillowcases(Sleeves 1 pillowcase, body- the other.) I made a lovely nightgown from the bottom sheet and still have the entire top sheet if you need it. Can’t wait to see your projects next month. « get your gear in order!